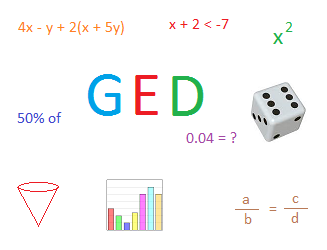 This GED math test will help you prepare to take the math portion of the GED. You will become familiar with the kind of questions that are likely be on the test. To past the test, you will need to have a good understanding of basic math concepts such as fractions, decimals, percents, proportion and how to use these in rear life situations. Next, you will need some knowledge of algebra such as how to simplify expressions, evaluating exponents, solving equations and inequalities and others. You definitely need to know how to find the perimeter, the area, and volume of commonly used shapes. Finally, make sure you undertand how to read graphs and interpret data shown on these graphs. My website can indeed help you master all these skills if you study carefully all the lessons. The test is scored on a scale from 100 to 200. The passing score used to be 150. However, apparently, it has been lowered to 145 in 2016. To pass the GED math test I put together on my site, you will need at least 150. I am also giving you 50 minutes to finish the entire test. The real test is now tougher than ever before. Therefore, Let us keep it this way so you can really challenge yourself and improve the likelihood that you will pass. Later on, you will thank me for it!